Details on the newest Halo entry have been sparse and few, far between. But thanks to the latest edition of Game Informer (which I am hoping to pick up tomorrow on lunch break) we are learning a boat load of new information about the game. 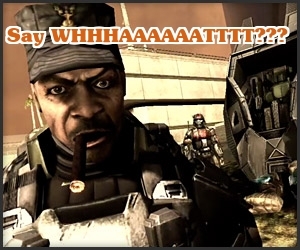 - Halo 4 is set in 2557 - four years, seven months and ten days since the FUD was split into two and the finale of the events of Halo 3. - New HUD, features subtle parallel movement during athletic actions and additional visual cues indicating that you are actually wearing a helmet. - Chief, Cortana and other characters animated with the assistance of motion capture. 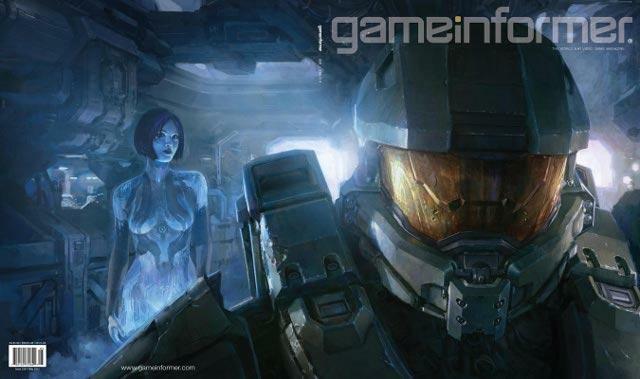 - Cortana impending rampancy will be a critical theme as will be exploring Master Chief as a person. - Cortana has chosen a new visual identity whilst the Chief has been sleeping. - The Covenant, at least Elites and Grunts, return but are not the primary enemy. - The FUD eventually crash lands on Requiem, a planet enclosed in a massive Dyson Shell. - A new faction from Requiem is introduced. Like the Covenant they will have unique and different enemy types, weapons and equipment. "If anything, they're kind of elevated in terms of their intelligence and complexity relative to the Covenant." - Huge, alive environments - a piece of concept art depicts a floating air squid in a jungle setting. - The sky box is filled with massive pillars reaching down from above and the surrounding view is painted by the inside of the Dyson Shell. - Game is split between Campaign and Infinity - the new term of the entire multi player experience separate from the Campaign. - Multi player directly and in-directly ties into the Campaign. 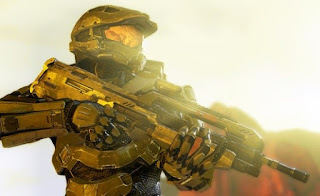 - Multi player features Spartan IV's - adult volunteers taken from the the best of special ops soldiers, equipped with a new version of the Mjolnir armor (lightweight variation) and deployed on board the UNSC Infinity. - The UNSC Infinity is the largest ship the UNSC has ever created. Over three kilometers long, it was designed with cutting edge technology and features some additional technological enhancements provided by the study of Forerunner technology - including faster and more accurate slip space travel. The UNSC is deployed on a top secret mission into deep space but will cross paths with the Master Chief during the campaign. - The Spartan IV's on board train in the Infinity's "combat deck" (think holodeck or Danger room). The deck and simulate any known environment and plays host the multi player games players are familiar with. - Firefight is absent and it is stated that there are no plans for it to return. - New Co-Op mode called Spartan Ops for up to four players in online Campaign-esque missions. - Spartan OPs introduces new movies sequences and missions on a weekly basis which tells the story of the UNSC Infinity's mission and battles the new Spartan IV's face. - Spartan Op missions are objective based and feature new content, events and locations each week. Spartan Ops missions also reward Spartan Points and feature selectable difficulty levels like Campaign. Spartan Ops missions are not DLC, they are included in the overall Halo 4 package but it is unclear if the content is available on the disc or must be downloaded separately. - Weapons in the overall sandbox include Assault Rifle, Battle Rifle, DMR, Assault Carbine, Covenant Carbine, Shotgun, Rocket Launcher, Sniper Rifle, Magnum and Plasma Pistol. There are numerous unrevealed, new weapons. I am planning on diving into this stuff further once I get my copy. Look for more on this info. and additional Halo 4 info here. Thoughts and opinions? Post em below.